I wanted to draw this building for years. It used to make me smile to drive past it. I ended up almost sorry that I did the drawing. I set up my little folding chair on a corner about half a block away and worked for many hours on it. I had put shadows in very early so I felt like I needed to work at the same time every day. It was July and quite hot and I could only work for about an hour at a time. That’s pretty much my limit anyway without walking around or working on a different drawing for awhile. After a day or so the kids that worked in the restaurant would come over to see how it was going. One day the owner appeared over my shoulder and said the staff thought the drawing was so great that he felt he should come over and see it. He admired it and said something about using it to advertise the place. I was all for this but I’m a terrible negotiator, not to mention the fact that it wasn’t finished, so I told him that I was probably going to use it for my Holiday card and I would send him one. If he was still interested we could talk. The next March I got a letter from the owner. He told me how much he liked the drawing and said that he definitely wanted to use it. He offered me “a lobster feast for you and your family” as payment. A license fee was more what I had in mind so I declined. 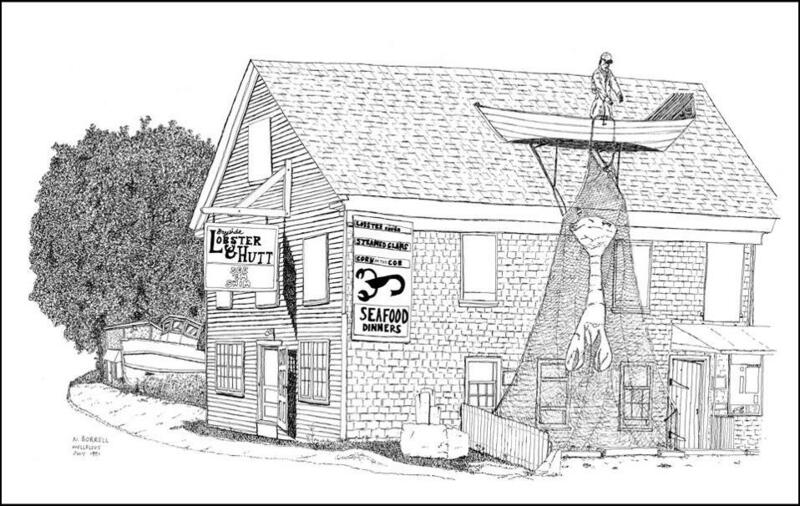 That summer we went back to Wellfleet and I began seeing new ads for the place which, in my opinion, used about a third of my drawing. He claimed that his version wasn’t a copy of mine but was a different drawing. 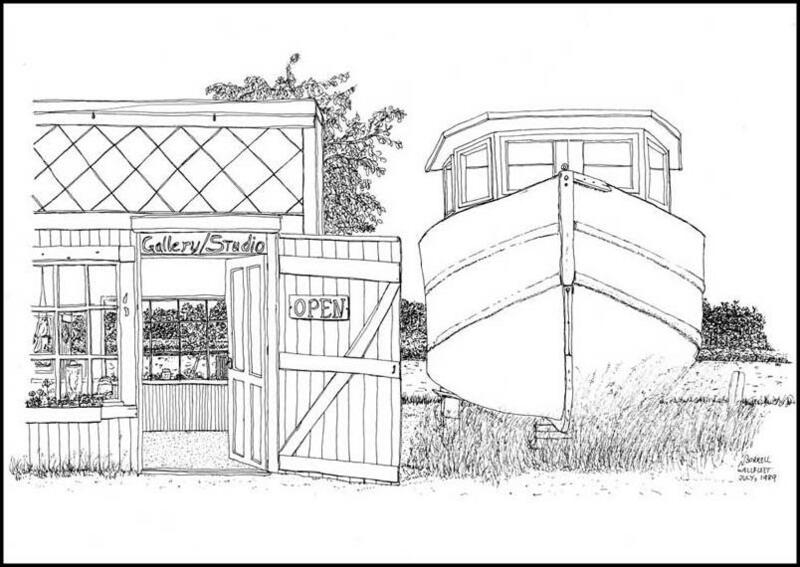 The upper windows of the place were now unboarded as they were in his ad but the rest was, in my mind, a copy of my drawing. I ended up deciding that someone had used tracing paper over my Christmas card and then drew in the windows. Maybe it’s a freehand copy but whatever it is it looks an awful lot like my drawing. 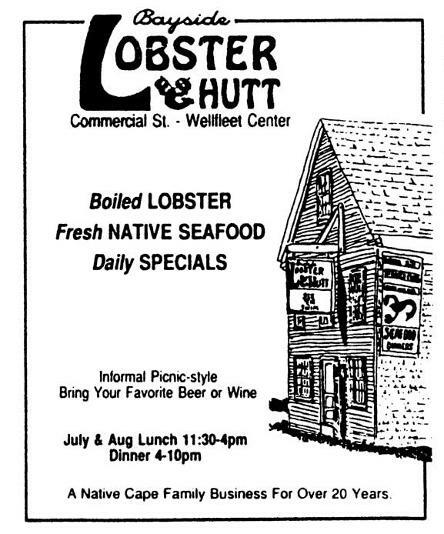 His ad showed about a third of the building but, for some reason, no fisherman or giant lobster. I was directed to a copyright attorney, ironically one who was famous for beating a claim similar to mine. The lawyer said that if this was in fact a copy of my drawing it was as if the copier had consulted his own attorney and been advised just how much to use in order to make the case difficult to decide. A friend suggested a lawyer on the Cape who pursued it for me, but when it came time to actually file a suit I made a decision. 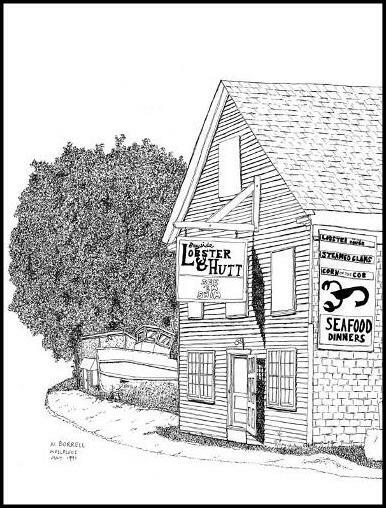 I decided that everyone in my family felt that Wellfleet was a very special place for us. A place full of wonderful memories. I decided that pursuing this case might tarnish all of that. I’m still annoyed whenever I pass the place but I’m glad I didn’t spoil Wellfleet for us. 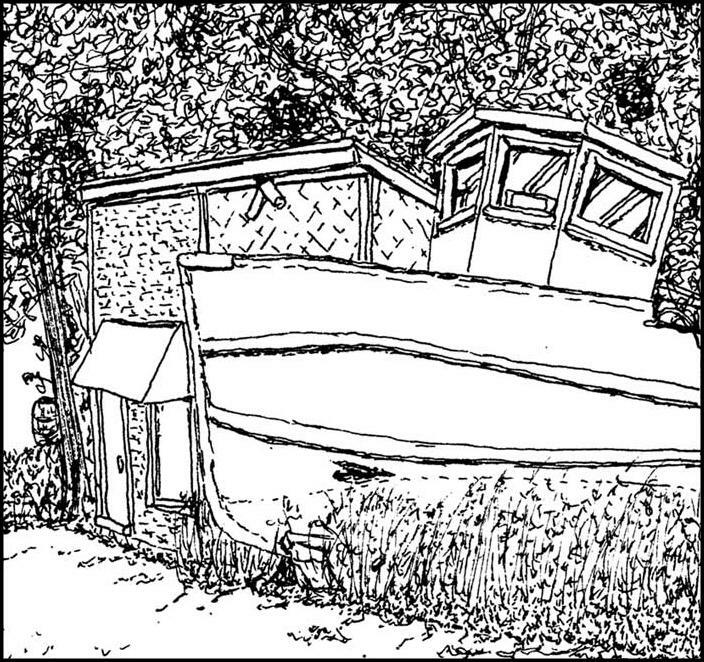 I did this drawing two years after the Commercial Street drawing that features this shop and the derelict boat. I considered finding another subject that would have this and the restaurant in the background and see how far I could go but never did.